Born in 1961, in France, Pascal Amblard began to display strong artistic talent and interest in drawing and painting as a small child. Scenes from the French Alps and the Rjiks Museum in Amsterdam so impressed the young boy that he still remembers the hours spent attempting to capture the beautiful landscapes and paintings that so impressed him. Although he initially pursued a career as an English teacher, studying in both France and Great Britain, Pascal’s artistic talent was rewarded during a summer holiday, when he produced and quickly sold small, hand painted toys – realizing a large profit. Opening a shop with his wife Pascale, he was hired to produce a mural for a restaurant, and began to accept new commissions for additional mural work. In 1989, Pascal attended faux finishing, graining and marbling classes in Paris, in lieu of mural classes, which did not exist at the time. He accepted a position at the Galerie Apparences in Paris, specializing in trompe L’oeil and mural painting. 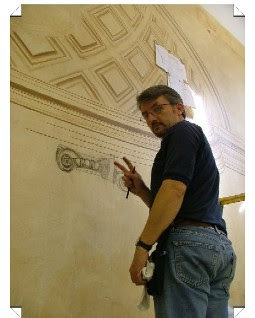 In 1993 Pascal was recruited by the IPEDEC to develop and lead their distinguished Mural Department, providing world-renowned classes in mural painting. In 1998, Pascal was invited to join the elite group of international decorative painters at their annual gathering called “Salon”. Shortly after, in 2001, Pascal hosted the Paris Salon gathering, which was attended by over one hundred renowned painters, representing fifteen countries. Pascal’s private clientele has grown to include collectors from various countries, including Germany and the United States, and his work is sought during the highly regarded European Homeshow, Maison & Objet, in Paris. Together with internationally renowned decorative artists Sean Crosby, Pierre Finkelstein and Nicola Vagini, Pascal co-hosts an annual, collaborative ten-day class in Italy, focused on mural painting, tromp l’oeil, graining and marbling. The class is attended by American artists over a ten day period. 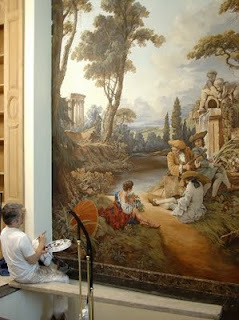 Pascal has joined artist Sean Crosby in his studio in Delaware, US, teaching and producing custom murals on commission. Additionally, Pascal and Sean have collaborated as featured artists in a new American gallery: Atelier Decorative and Fine Art in Greenport, New York – serving clients on the eastern end of Long Island and Manhattan. 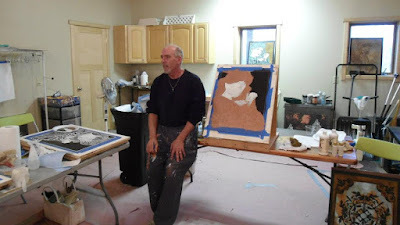 Atelier offers a wide range of work including murals, faux finishes, graining, marbling, tromp l’oeil, and portraits, as well as classes in decorative and mural painting. With this new Gallery venture, Pascal has broadened his artistic repertoire to develop fine art pieces. Included in his 2006 collection is a group of new paintings “the North Fork Series”, which depict the beauty of the eastern villages and beaches of Long Island, New York. Pascal’s paintings continue to elicit praise and inspire clients due to composition, attention to detail and exquisite play of light within each piece.